Joseph Michael’s photo series Luminosity could be considered a very successful distraction. 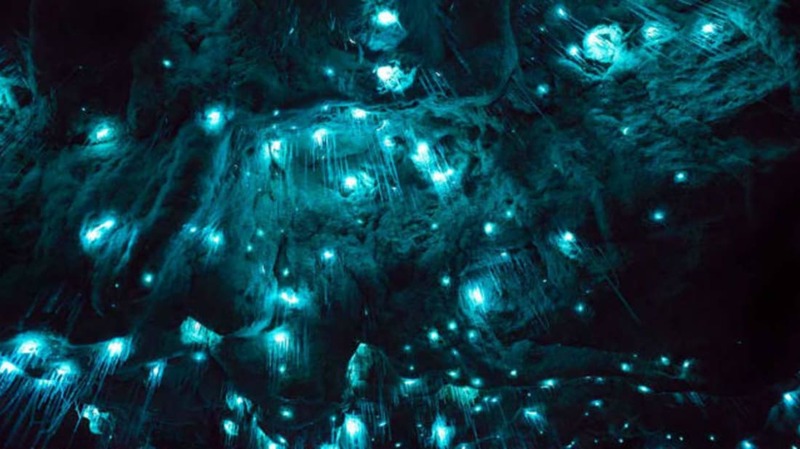 The digital images of glowworms were taken in New Zealand as a break from a larger project involving taking photographs of Antarctic icebergs that will later be projected onto buildings around the world. Found only in New Zealand, this glowworm (Arachnocampa luminosa) is a member of the gnat family and settles in limestone caves and other dark and damp habitats. All glowworms use bioluminescence: larvae use it to lure prey to their nests, while adults rely on the light to attract mates. To take the long-exposure photos, Michael visited multiple limestone caves on New Zealand’s North Island, looking for ones that were both architecturally interesting and that housed lots of glowworms. Capturing the pictures required him to stand in the cold water for hours and wait. On his Facebook page, Michael explained that the exposures ranged from five minutes to an hour depending on how close he could get to the worms. In an interview with WIRED.co.uk, Michael said that the motivation behind his art and photography is “to give someone the opportunity to look at something different, create a deeper perspective on the things we see every day."